Chinua Achebe died at exactly 11:51pm (US time). That is 4.51am (Nigerian time), on Thursday, March 21 at the Harvard University Teaching Hospital, Massachusetts, USA, aged 82. 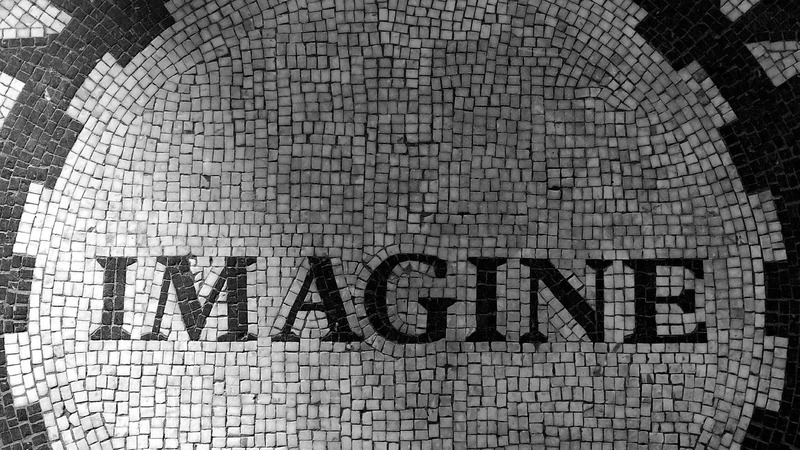 It was one death that shook the entire world as tributes came pouring in from all the continents of the world, from presidents down to paupers. For some of his admirers, the world stood still, yet for orders events moved at a frenetic pace, culminating to the Thursday, May 23 interment of the icon in his native Ogidi, Anambra State. The one-storey home of Chinua Achebe looks quite modest from the outside but it has a lift inside. The building for me captures the essence of the great progenitor of African literature: the quality of what is within is greater than any showiness outside. The mausoleum constructed to the side of the frontage of the building bears the heavy burden of the memory of Mother Africa in the buried remains of Professor Albert Chinualumogu Achebe, the inimitable author of Things Fall Apart. 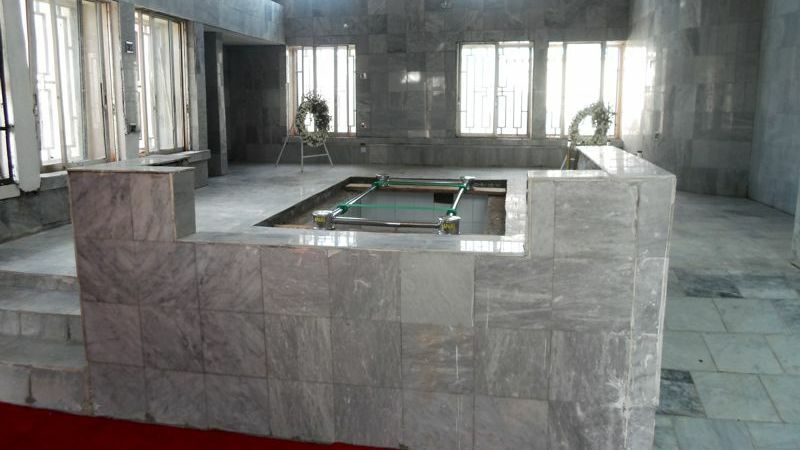 Achebe was interred at 4.30pm in a marble tomb in his Ikenga village ancestral home of Ogidi town in Idemili North Local Government Area of Anambra State. He was given an elaborate Christian funeral service at St. Philips Anglican Church, Ogidi, as opposed to the African mores he championed in his novels. President Goodluck Ebele Jonathan made his presence felt even though Achebe had rejected his award of the Commander of the Federal Republic (CFR). President Jonathan was in the distinguished company of Ghanaian President John Dramani Mahama. Governor Peter Obi of Anambra State was akin to a chief host and even doubled as the Master of Ceremonies along the line. The politicians actually dominated the scenes, with the writers dwarfed out of sight. The many contenders for the forthcoming gubernatorial elections in Anambra State, notably Senator Chris Ngige, Dr Andy Uba, Dr Ifeanyi Ubah, Dr Obinna Uzoh, etc., jostled for space with their supporters. President Jonathan sang the praises of Achebe as a philosophical writer whose insight tore through the heart of Nigeria’s national problems. He cited Achebe’s The Trouble with Nigeria and There Was a Country as works that fearlessly held to account the political leadership that sent the country on the backward spiral since independence. Ghanaian President Mahama stressed that with the death of Achebe “writers in the African continent and the Diaspora have lost a mentor and literary godfather.” According to President Mahama, “In the same way that Chinua Achebe’s books helped foster the talent of countless writers in Africa’s post-colonial era, they also inspired a number of Africa’s current political leaders. President Jonathan rose up to make a second speech at the funeral in which he announced that both the Nigerian and Ghanaian governments will completely reconstruct St Philip’s Primary School in Ogidi which Achebe had attended. The church service started at a few minutes after 11am with President Jonathan, President Mahama of Ghana, former Vice-President Dr. Alex Ekwueme, former Commonwealth Secretary-General Chief Emeka Anyaoku, Minister of Finance Dr. Okonjo-Iweala, Deputy Speaker of the House of Representatives Ihedioha, Governor Emmanuel Uduaghan of Delta State, Governor Rochas Okorocha of Imo, host Governor Peter Obi of Anambra State, ministers and senators in attendance. Crowd control proved quite difficult for the many security operatives who meted out brutality on the ordinary people. Most Rev Nwosu had to admonish the potentates that it was wrong to punish the people they ought to be protecting. Achebe’s first son Dr. Ikechukwu Achebe gave the vote of thanks on behalf of the Achebe family, saluting President Jonathan and President Mahama of Ghana, Nigeria’s National Assembly, governors, the literary community, high chiefs, and the multitudes of admirers of his lionized father for the outstanding burial. 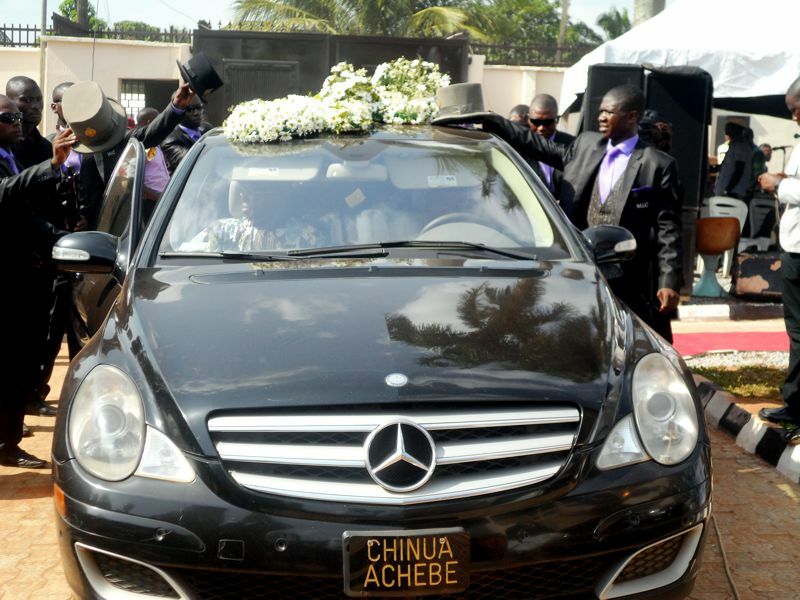 The elaborate burial programme for Achebe started on Sunday, May 19, with a day of prayers and religious worship at the National Christian Centre, Abuja. 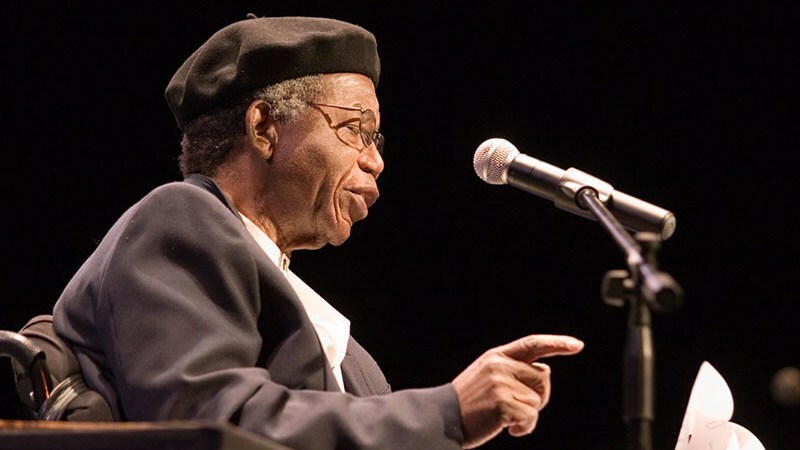 Then the Association of Nigerian Authors (ANA) which Achebe founded held a symposium on the life and times of the legendary author at the International Conference Centre, Abuja in the morning of Monday, May 20. This was followed with an evening of tributes by the politicos and the literati with many cultural troupes performing. Achebe’s remains arrived at the Nnamdi Azikiwe International Airport, Abuja on Tuesday, May 21, draped in the Green-White-Green flag of Nigeria and accompanied by his wife Prof. Christie Achebe and children Dr. Chinelo Ejeiyutche, Dr. Ike Achebe, Dr. Chidi Achebe and Prof. Nwando Achebe. The Secretary to the Government of the Federation Chief Anyim Pius Anyim was at the airport as the head of the Federal Government delegation. Governor Peter Obi accompanied the Achebe family in the flight from Abuja to Akanu Ibiam International Airport, Enugu, where the body was received by the Governors of the Southeast States and leaders of the pan-Igbo organization Ohanaeze Ndigbo. A celebration of life carnival was staged at the Alex Ekwueme Stadium, Awka on Wednesday, May 22, whilst ANA put up a festival of life.